The entry and payment deadline are 11:59pm on Tuesday the 20th. Be sure all entries and payment are in by then. I will seed the meet the morning of the 21st and any team not entered or paid, will be removed from the meet prior to seeding. Any school not signed up to work an event at the meet (see link below) will have their athletes removed from the meet prior to seeding. Coaches check your entries (especially for the 400m and 400 hurdles). If you already entered, we removed your slower athlete, since the # of athletes for that event is listed at 1 each. This was a change that was not corrected on SCRunners, until this morning. We are sticking to the deadlines, so be sure you meet all deadlines. Both Coach Lee and myself teach a full class load and will not answer calls or emails about whether a team is paid or entered or signed up to work. All links are below. ONLINE PAYMENT OPTION IS ON THE ASSOCIATION SITE. Any school that does not check in to work their field event will be called to the event one time over the PA system. 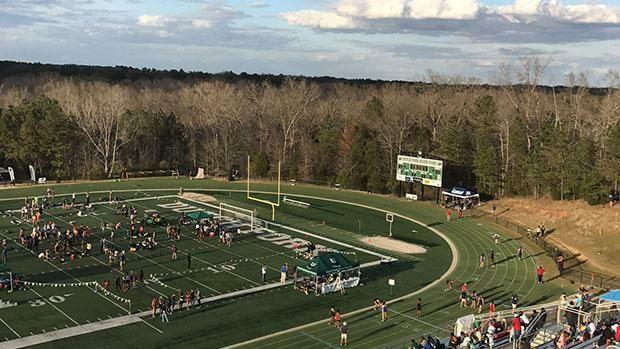 If the school still does not send a worker, athletes from that school will be scratched from the rest of the meet and all current results will be DQ'd. Please note the time schedule changes from last year. I will post the SLOW sections of the 3200m by 9:30am on the 21st. If you decide to drop your athlete from this heat, please email me by noon on the 21st so we can move/combine heats. WE WILL NOT MOVE ATHLETES FROM THE SLOW SECTIONS TO THE FAST SECTION! Goal is to have the entire meet posted by noon on the 21st. AGAIN, THE MEET WILL BE SEEDED BY NOON ON WEDNESDAY THE 21ST AND WE WILL NOT ADD SCHOOLS THAT WE RECEIVE PAYMENT FROM AFTER TUESDAY AT 11:59PM. YOU HAVE HAD ENOUGH NOTICE TO GET THIS COMPLETED AND HAVE AN ONLINE PAYMENT OPTION. DO NOT WRITE TO US SAYING IT WAS MAILED.